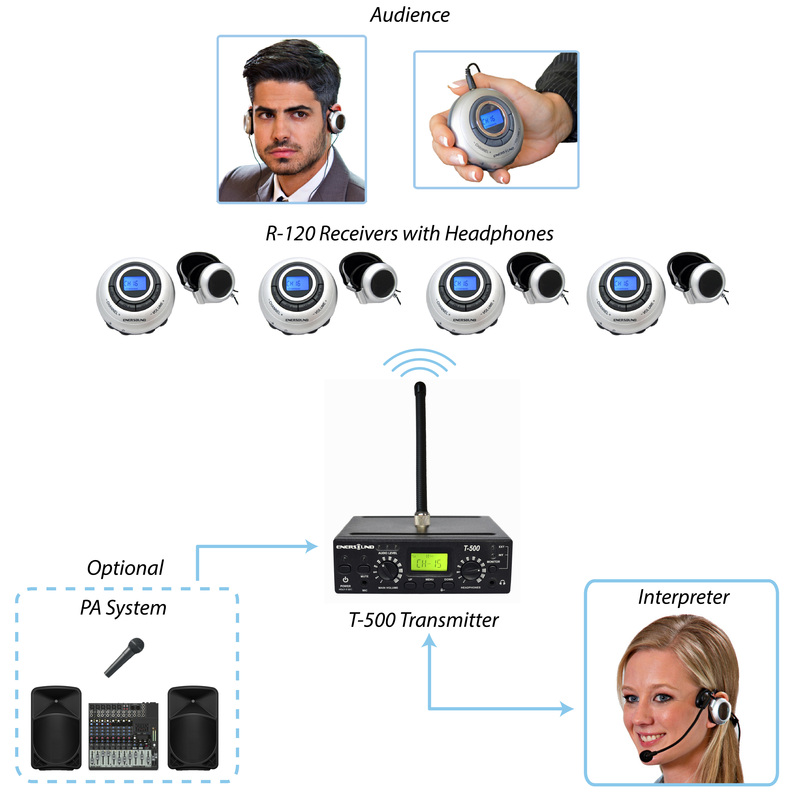 This 10-person Professional-grade Wireless Simultaneous Translation System provides superior sound quality and excellent coverage range, combining multiple-channel transmitter and receivers, as well as improved reliability and versatility. It can be expanded by adding an unlimited number of additional receivers. More foreign languages can be added for a maximum of 6 in the same room by purchasing 1 additional transmitter and microphone per language. Specially designed for language interpretation, it has a unique integrated interpreter console function. This feature allows interpreters to select an external incoming audio source and utilize a headset with microphone to listen to the source language without the need of an interpreter console or external headphone amplifier. Through the headphones’ volume control, interpreters can set the desired incoming audio level and the mute button allows them to momentarily silence their microphone for coughing or sneezing. This system is ideal for houses of worship, conference rooms, courtrooms, and auditoriums. Note: This system requires a human language interpreter, it does not translate automatically. -Enersound R-120 FM multichannel receiver: Lifetime warranty on motherboard. 1 year factory warranty on all parts. Lifetime replacement or exchange program that allows you to return any damaged receiver for a repair or replacement for US$ 17.00 plus shipping fees. -Enersound T-500 FM multichannel Transmitter: Lifetime warranty on motherboard. 1 year factory warranty on all parts. -EAR-120 Headphones: 90-day factory warranty. -CAS-10 Carrying Case: 1 year factory warranty. -MIC-300 Microphone: 90-day factory warranty. Contact us or see manufacturer site for more details. It became essential for our community! At first we were not sure about the system. It seemed complicated, but its really not! This piece of technology is simple, ease to use, realiable and affordable! Our Portuguese speaking churchgoers love it! Now it seems essential and we can´t think of any other way to share our service with the community! We love it! After reading an article about interpretation and following my interpreter's advice I purchased this system and I don't regret it.It makes it all perfectly. I have been looking for a system that let me integrate people from other countries that are part of my congregation.This equipment was the solution for my church and it works perfectly.Thanks! Believe it or not they have finally found a solution with this interpreter monitor option.This system is a valuable resource for anyone interested in his congregation.I have highly recommended this system to my ministry partners, and I will continue to recommend it to all I have contact with.Thanks! The experience I had was, to use an over-used cliché, life changing.I found nothing that helped me in the areas where help was needed most.I was able to preach as never before.They were neglected and people come to my church now because they feel good and the benefit and value were far greater than the cost; this package was a bargain. We had to have it! Every buck spent here paid off!.Simple and effective, and it can stimulate a spirit of inquiry in students.While I applaud the old methods now we have decided to use this system. When something so important for us is made easier the interpreters and people in this business are thankful.Thanks! I had been looking for something like this for years,awesome performance and price. We love the features of this system. At first we were not sure if we were going to use all of them, but once the sales rep. explained us how it worked, we saw how much it could welp our congregation, and we were right. Totally satisfied. Click the button below to add the 10-Person Translation System with Interpreter Monitor to your wish list.